Should Che be an icon? YES! From Caracas to Cape Town, Ches- terfield to Cowdenbeath, one man’s admittedly handsome face on a T shirt tells you more about its wearer than how well he or she fits it. Ernesto «Che» Guevara Lynch, who was murdered by United States agents under orders from Washington 40 years ago, is the face of global rebellion. He inspires all the more intensely since he could have lived a prosperous bourgeois life as an Argentine dentist. Instead, and despite asthma, he chose a life of action, a motorcycle diarist, a comandante in a triumphant Cuban revolutionary army, a guerrilla leader in the Congo, a martyr in the mountain gulleys of Bolivia. It’s true he had a spell as a bank manager – but it was the governorship of Cuba’s revolutionary state bank. It was the 1950s motorcycle tour that did it. The immiserated wastelands of Latin American, where the poor starved, the latifundists larked and the US corporations sucked the blood of South America. In 1954 he witnessed the overthrow of the reforming Guatemalan government at the behest of the United Fruit company, run by those scions of the US establishment, the Dulles family. By the time Che Guevara met Fidel Castro a year later he was a rebel. After, he was a revolutionary. Guevara had absolutely no military background and signed on with Fidel as the rebel «army’s» doctor. In the mountains of eastern Cuba in the late 1950s he became a military leader and a strategist of revolutionary warfare of the first order. It was an old-fashioned ethos: lead your men (and women) from the front and don’t ask them to do anything you aren’t prepared to do with them. It was in no small measure due to his military victories that the Cuban revolution triumphed – the rebels’ entry into Havana on New Years Day 1959 is memorably recreated in the Godfather II. The Mafiosi and the bordello owners headed for the airport with the barbaric dictator Fulgencio Batista. Those who would traduce Che, Fidel and the Cuban revolutionaries must say what Cuba would be like now if that dictatorship had held on – Haiti, the most hellish place in the Western hemisphere is literally not far from Cuba, but metaphorically in a different universe. By the standards of Cuba’s blood-drenched history the retribution visited on the dictator’s henchmen was light – even according to the US ambassador to Havana and the head of the CIA at the time, Alan Dulles. Even as Cuba, in the grip of the US’s embargo, looked to the Soviet Union for support, Che was prepared to criticise the bureaucratism he saw in Moscow. It’s a staple of liberal and conservative cynics that revolutionaries such as Che ineluctably end up mirror images of the monsters they set out to overthrow. No one shatters that lazy cliché more than Che. That internationalism, which has become a leitmotif of today’s movements, connected him with the masses on every continent. Even the coldest of latter-day Cold Warriors must have been moved by the recent story that a Cuban medical team last year saved the sight of Mario Teran, the Bolivian sergeant who executed Che. One of the greatest mistakes the US state ever made was to create those pictures of Che’s corpse. Its Christ-like poise in death ensured that his appeal would reach way beyond the turbulent university campus and into the hearts of the faithful, flocking to the worldly, fiery sermons of the liberation theologists. Which leaves the liberals, who say that they too, as Che put it, ‘. . . tremble with indignation at every injustice,’ but who turn up their noses when the despairing mass of people resort to force against the daily violence of the elite. Today, a new generation is struggling for progress – drawing strength from Hugo Chavez’s Bolivarian revolution, while many of us also remain mindful of the catastrophe that engulfed Allende and the Chilean movement when those who stood in its way were not defanged. To wish Venezuela’s social reforms without Che’s revolutionary steadfastness is to will the first 11 September atrocity – Santiago, Pinochet, 1973, gunfire drowning the song of a new Chile. Che’s time is not past – it is coming. I was struck recently by the remarkable introduction by Lucia Alvarez de Toledo to a compilation of Che’s Bolivian diaries. She met the daughter of the telegaphist in the Bolivian village where Che was taken who had communicated the first written word of his murder. *George Galloway is a british politician and a Member of the British Parliament from 1987 to 2010. Since 2004 he is a member of the Socialist political party «Respect» in the United Kingdom. Article published on «The Independent». 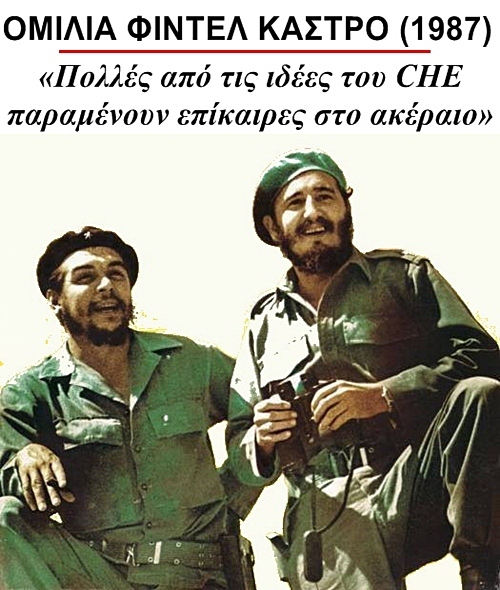 Δημοσιεύθηκε την Οκτώβριος 9, 1967 Μαρτίου 4, 2014 από GuevaristasPosted in Ernesto Che GuevaraΜε ετικέτα Analysis,Ernesto Che Guevara,George Galloway,Respect Party,The Independent.